Matthews Environmental Solutions UK has a long-standing and ongoing commitment to enhancing the efficiency, reliability, environmental compatibility and the user safety of all our waste incineration process technology. Now as an important conformation of this pledge and as part of our company’s vision for the future, we have appointed Lucy Thame as our new Safety, Health, Environment & Quality (SHEQ) Compliance Manager. Lucy is a highly regarded specialist within the engineering sector and she brings an immense level of experience and knowledge to help us accomplish all our SHEQ objectives. Her primary focus will be to lead the development of what is arguably the most important elements of the company’s waste incineration, human cremation and pet cremation products … enhanced safety, guaranteed quality and environmental excellence. Within her new role Lucy will take control of the company’s Integrated SHEQ Management System, bringing together ISO 9001: 2015 (Quality Management), ISO 14001:2015 (Environmental Management) and OHSAS 18001: 2007 (Health & Safety Management). Lucy, who has worked in the health and safety industry for 20 years, has built a unique experience across a wide range of technical safety and risk management practices. These extend to quantified risk assessment techniques, including event tree analysis and consequence modelling, as well as safety management system support. Crucially, she has provided invaluable support to clients on major risk and occupational risk assessments, in addition to developing and auditing safety management system procedures, plus of course communicating health and safety information to the workforce, senior management and regulatory bodies. Lucy’s experience has been primarily within the oil and gas industry, but the techniques and practices used within that sector, together with much of the legislation and regulatory processes that are applicable, are readily transferable to our waste incineration process industry. As today’s international safety and environmental protection standards continue to be developed and together with a growing demand for increased technical capabilities, Lucy’s extensive experience and technical safety background will be invaluable to the company. Not only will she be qualified to develop the H&S and quality standards as well as the environmental aspect of our waste incineration process and procedures, she will also be available to input her own specialist knowledge at the inaugural design stage. This will help to ensure that any bespoke and customised specifications required are appropriate to meet the most rigorous technical, compliance and environmental demands. 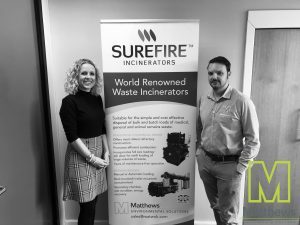 If you are currently planning for new waste incineration, pet cremation or human cremation equipment, or if you are looking to upgrade your existing plant then you must speak to Matthews, the world’s leading waste incineration process specialists, to discover how we can help you achieve all your objectives. You can call us on +44 (0)161 337 4488. You can also email us at: sales@matwuk.com or you can also send us an online message using the form that can be found on our Contact page.